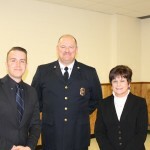 "Your Life is our Mission"
Congratulations to our newest member and most recent promotions! We made a bit of history at last nights Town Board meeting with our largest Full-Time hiring since the Department formed almost 30 years ago (we swear we are still 29 years old). We are delighted to have added 4 Full-Time Paramedic positions and 4 Full-Time EMT positions to the Department. Over the years, our call volume has steadily increased and these staffing changes reflect the pride we take in meeting the needs of the community that we serve. This year alone we have answered 12,000 calls! It is always our goal to provide the residents and visitors of Colonie with prompt and exceptional service. New and current members of Colonie EMS. 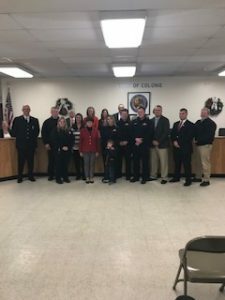 Newest full time members with Town Supervisor Paula Mahan, Members of the Town Board, Chief Peter Berry and Medical Director Dr. Michael Dailey. If you were looking to become an EMT or re-certify as one, here’s your chance! 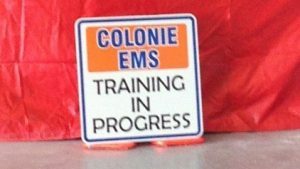 Colonie EMS will be offering a Day and a Night EMT Original and Challenge Refresher. Call 518-782-2650 with any questions. 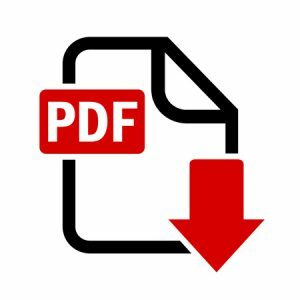 Fill out an application and return to the Department with your Lab Materials Fee (all students) and Tuition or Verification of Membership in a NYS EMS Agency. Please note, we are unable to process credit cards – we are only able to accept cash or checks/money orders. Not sure if your EMS Agency qualifies for reimbursement? Check here. If you are a member of one of the agencies listed as funding eligible (‘Y’ in the right hand column), fill out the above form and submit with application and Lab Materials Fee. As you may have noticed… it is cold out! Extremely cold temperatures make staying warm and safe a challenge. 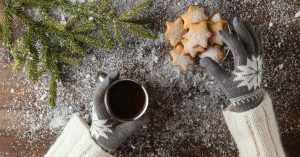 Exposure to cold temperatures, whether indoors or outside, can cause other serious or life-threatening health problems. Anyone can be affected, however infants and the elderly are particularly at risk. Here is some information to help you stay healthy and safe during this extreme cold. The World Health Organization suggests keeping indoor temperatures between 64 and 75 degrees Fahrenheit for healthy people. 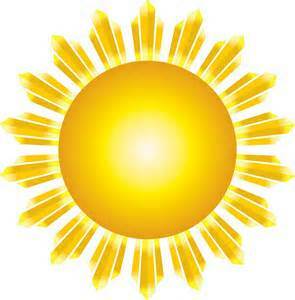 Ideally the temperature should be kept above 68 degrees Fahrenheit to protect the very young, the elderly, or people with health problems. Watch for signs of hypothermia – shivering, confusion, memory loss, drowsiness, exhaustion and slurred speech. Infants who are suffering from hypothermia may appear to have very low energy and bright red, cold skin. Frostbite symptoms include numbness, flushed gray, white, blue or yellow skin discoloration, numbness, or waxy feeling skin. Call 911 immediately if you suspect you or someone you know is suffering from either condition. When outside, especially in high wind conditions, take extra precautions to reduce the risk of hypothermia and frostbite. Be sure your outer layer of clothing is tightly woven to reduce body-heat loss caused by wind, and cover exposed skin. Listen to your body! Do not ignore shivering – it is an important sign that your body is losing heat and a signal to quickly return indoors. Cold weather puts an extra burden on the heart. If you have cardiac problems or high blood pressure, follow your doctor’s orders about shoveling or performing any strenuous exercise outside. Healthy adults should remember that their bodies already are working overtime just to stay warm. Dress appropriately and work slowly when doing heavy outdoor chores. Bring your pets indoors. Yes, they have fur but extreme temperatures effect them too. Also, salt from roads and walkways can damage their paws and may lead to inadvertent toxic ingestion. If you are having trouble paying your bills this winter, you can call or visit the NYS Home Energy Assistance Program (HEAP) website or Hotline at 1-800-342-3009. Be a good neighbor – check on your neighbors, especially if they are elderly. Do your best to clear walkways of snow and ice to avoid injury from falls. Use extreme caution in clearing your roof; consider using a specialist who has the right tools. 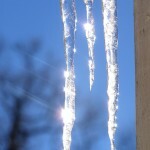 Falling icicles and heavy snow can cause life threatening injuries. Take precautions to avoid exposure to dangerous levels of carbon monoxide. 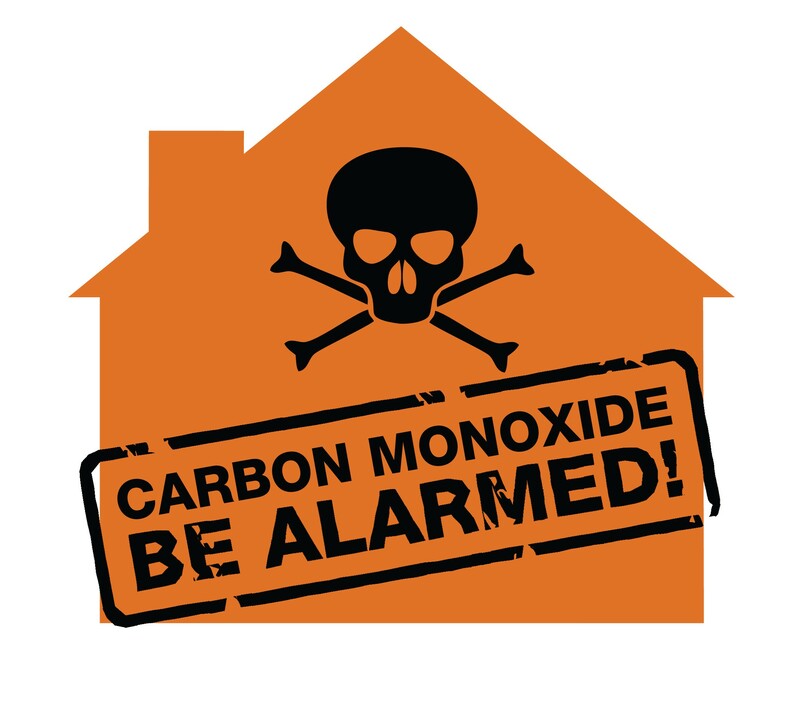 Carbon monoxide (CO) is a potentially deadly gas. It is colorless, odorless, tasteless and non-irritating. It is produced by burning fuels such as wood, oil, natural gas, kerosene, coal and gasoline. Symptoms of carbon monoxide poisoning are similar to the flu but do not include a fever. At lower levels of exposure, a person may experience a headache, fatigue, nausea, vomiting, dizziness, and shortness of breath. 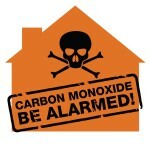 Exposure to very high levels of carbon monoxide can result in loss of consciousness and even death. Make sure you have smoke and CO alarms in your home. Test them once a month and replace the batteries twice a year. Wood stoves, space heaters, electric heaters, kerosene heaters and pellet stoves can be dangerous unless proper safety precautions are followed. DO NOT start your car to warm up in a garage. Try to avoid using extension cords to plug in space heaters. If you have to, make sure they do not become a trip and fall hazard and do not run extension cords under rugs. Make sure supplemental heaters are in a safe place to avoid being knocked over unintentionally. To avoid frozen pipes, keep the heat on and set no lower than 55 degrees. You can also let faucets drip a little to avoid freezing, open cabinet doors to allow more heat to get to non-insulated pipes under a sink or appliance near an outer wall. In your home, keep several days’ supply of food that needs no cooking or refrigeration (remember baby food and formula if you have young children), water stored in clean containers (5 gallons per person), and medicines that any family member may need. In your car, keep the gas tank near full to help avoid ice in the tank and fuel lines. Make sure your vehicle is up to date on maintenance and serviced including the radiator system serviced, replace windshield-wiper fluid with a wintertime mixture, replace any worn tires, and check the air pressure in the tires. For more info on how to prepare for extreme cold conditions, please check the CDC guide here. 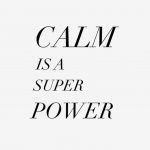 It is difficult to imagine ourselves during our everyday routine, in a situation where we are faced with life, death and survival. Sadly, it has become common occurrence for large gatherings, or even daily activities to become the target of bad people looking to do bad things. Whether we are going to work, walking down the street or spending an evening out with our friends, the question we need to ask ourselves is how prepared are we to help ourselves and others in the event of an incident? Being an Emergency Medical Service, we obviously would like you to be prepared for the more common incidence of a medical emergency by knowing basic first aid and CPR. Sadly, even our own focus has shifted to include training for the less likely, but more unsettling scenarios of shootings and other acts of violence that multiple victims are associated with. The Albany County Sheriff shared a video on what to do during an active shooter incident. As an overview, you can view the video here. The principles highlighted in this video can be applied to a variety of scenarios where you may find yourself waiting for help to arrive and needing to tend to others or even yourself, not just an active shooter. Regardless of the event, you can do certain things to help yourself and others survive if injuries are sustained. It may so happen that the first responders you see, are not there to administer first aid or evacuate victims, so you may be waiting a while. First and foremost, try to stay calm and get yourself to the safest place possible if you cannot evacuate the scene. Be aware of your surroundings at all times and call 911 when it is safe to do so. Likely injuries to be seen during incidents such as shootings or even natural disasters, will involve bleeding. If someone is suffering from an arterial injury, they can die from blood loss in less than a minute. Placing direct pressure over the spot that is bleeding is the first step in attempting to stop deadly bleeding. 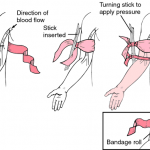 Anything can be used make a bandage in an emergency, but the important part is constant pressure. 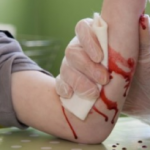 If constant pressure does not stop the bleeding, you may have to make and apply a tourniquet. You can make one (or several) with strips of cloth and a hard object such as a stick, pens, markers, scissors (you may have to use your imagination). If you or someone else is wearing a belt, that will work as well. Unfortunately, some may be too injured for you to help. if you encounter someone who is not awake or will not answer you or follow direction, the best thing to do may be to leave them where they are in what is called the recovery position. Place the person on their side, with their bottom arm outstretched, top arm under the head and top knee bent to ensure they do not roll onto their stomach. The head should be somewhat tilted back This is the safest position for them to be in if they are not awake or unable to move. Thinking about becoming a first responder? This course is a great way to get your feet wet. Check it out! If you haven’t already, change the batteries and test the function of smoke and carbon monoxide detectors. Alarms should be located in every bedroom and in the common areas on each floor of your home. Mount them at least 10 feet from the stove to reduce false alarms, less than 12 inches from the ceiling and away from windows, doors and ducts. Practice evacuation and emergency drills at home with your family. Fire drills are not just for schools! Make sure you have a meeting place outside and everyone in the house knows how to get out. It is a great time to replenish or restock your emergency supplies in the home! 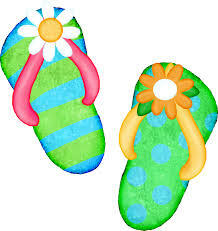 Spring presents its own hazards when it comes to slips, trips and falls. Although there is no longer ice and slush to worry about, as the ground thaws, dirt and gravel can loosen becoming a fall hazard. Make sure you wear the appropriate footwear with good tread and ankle support while working in the yard to give you an advantage. Also, during those April showers that’ll bring May flowers, mud and wet surfaces can be just as slippery as ice if you’re not careful. Year round, remember to be careful of small rugs or carpet corners as they are common reasons people fall inside the house. So go ahead, get your pedicures and break out the flip flops, it’s been a long winter and you deserve it… but don’t forget to walk with caution. 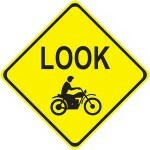 Watch out for motorcycles, bicycles and pedestrians while you are driving. 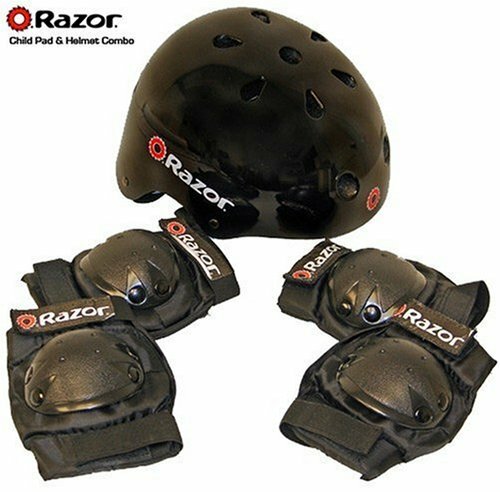 Have children’s helmets and other protective gear properly sized. These are not something that children can grow into, and they definitely can be grown out of. If protective gear does not fit properly, they will not offer sufficient protection or even cause more harm. It is also the law that anyone ages 1-14 must wear helmets while operating bicycles, non-motorized scooters and skateboards. Parents may face a fine if these laws are not followed. A teenager wears recommended clothing and safely mows the lawn. Be careful when doing yard work. 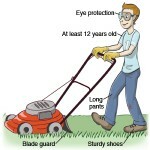 Chemicals, tools, lawnmowers etc., can cause serious injury or death. Make sure you know children and animals are in a safe place while working in the yard and especially operating power tools and lawn mowers. If you have a riding lawnmower or yard tractor, children should not sit on laps while mowing, ever! 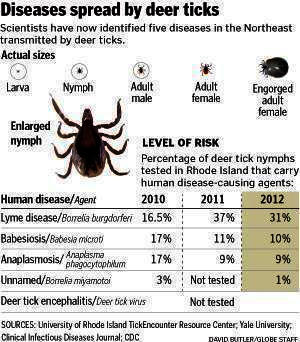 Check yourself, family members and pets for ticks. 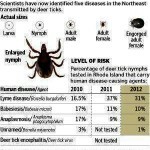 Lyme disease and other tick borne illnesses are prevalent in this area. Bees and other stinging insects are now out and active. If you or your children have known allergies, make sure there is an EpiPen or equivalent readily available. If you are not sure what the signs and symptoms of an allergic reaction are, click here. Allergies in general are predicted to be severe this year. Keep an eye on the allergy forecasts, as these may worsen illness’s such as asthma. 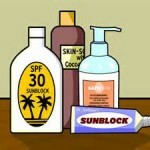 It is never too early to wear sunscreen. 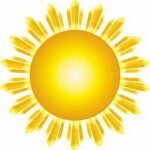 Anything above an SPF 15 is effective in reducing the risk of skin damage that can lead to skin cancer (and signs of aging) when reapplied frequently. 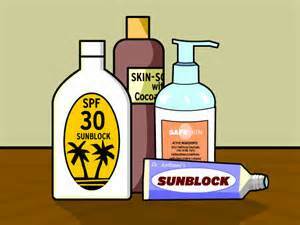 And yes, indoor tanning counts as sun exposure. Wearing layers can also protect from the sun and wind. From everyone here at Colonie EMS, we wish you a happy, healthy and safe Spring! 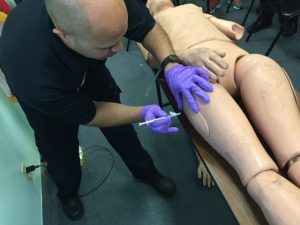 EMT’s training in the new “Check and Inject” procedure for administering Epinephrine. 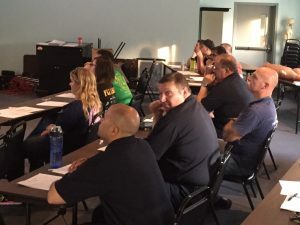 EMT’s learn to draw up and administer Epinephrine for the treatment of Anaphylaxis. Every year one week in May is set aside to reflect on the accomplishments of EMS providers across the country. This year we were honored to not once, but twice for the high quality care that Colonie EMS EMT’s and Paramedics provide. In the first days of 2016, a young woman and her daughter were out shopping on Central Ave when the mother’s heart stopped. Recognizing that something was terribly wrong, her daughter called for help. This began a chain of events that lead to the successful resuscitation and complete recovery of her mother. While calling 911, a bystander heard calls for help and immediately began CPR. 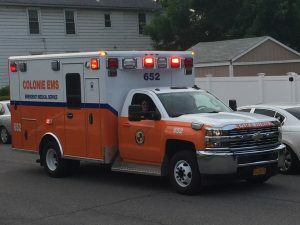 The 911 dispatcher then sent the closest fire, police and EMS units to the scene while gathering vital information from the caller at the scene. First responding police units arrived and took over CPR and utilized the AED they carried and delivered the first shock. 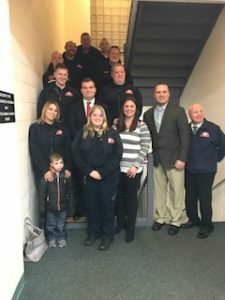 Colonie Village Fire Company personnel arrived and assisted at the scene while EMS continued live saving ACLS care and delivered the patient to Albany Medical Center where she underwent Cardiac Catheterization and had a full recovery… And now two birthdays to celebrate. 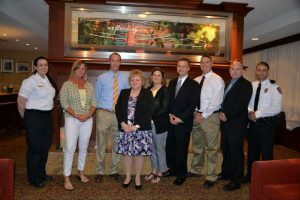 On May 19th, we were recognized by Albany Medical Center at their EMS appreciation dinner for our care of the patient. That was only one example of the high quality care we aim for. Everyday we encounter patients that require advanced cardiac care. 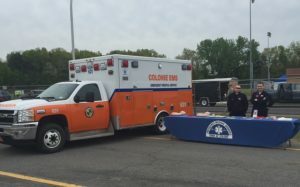 Colonie EMS received recognition from the American Heart Association for following the latest research-based standards for acute coronary syndrome with the Silver Recognition. 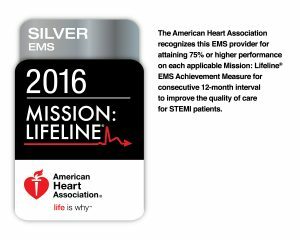 Agencies earn Silver recognition for achieving 75% or higher adherence for 12 months on all Mission: Lifeline EMS quality measures to improve the quality of care for STEMI (heart attack) patients. This is a great honor for the department and all its providers. 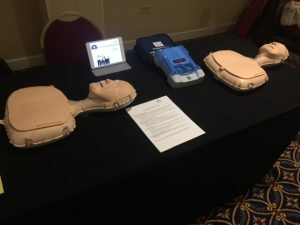 If you are interested in becoming a vital part of the chain of survival by learning CPR, click here. It’s officially Spring, and new leaves are starting to show around Colonie EMS. 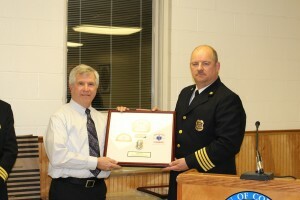 First and foremost, Assistant Chief Paul Fink is retiring after 40 plus years of service with the Town of Colonie. Since 1975, Chief Fink has been providing Advanced Life Support (ALS) in Colonie. 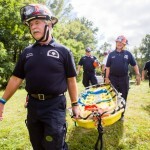 Throughout his career he has also worked locally with Guilderland EMS, the Regional Emergency Medical Organization (REMO) and the New York State Department of Health. Chief Fink is also a member of the NYS Division of Homeland Security Urban Search and Rescue team and served at Ground Zero after the terrorist attacks of 9/11. 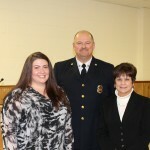 He is currently a life member of the Latham Fire Department as well. Always on duty, one of his many accomplishments was earned while dining with his wife. 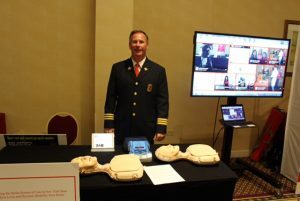 He was able to save a choking mans life, earning him the REMO provider of the year award in 2014. 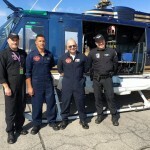 Since being one of the founding members of Colonie EMS in 1989, he has been involved in the Albany County hazardous materials team, NYSP Lifeguard Air Rescue Program as well as all the specialty rescue programs the EMS department participates in. 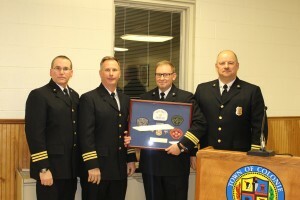 His most recent efforts included helping organize the departments Tactical Medic program. In his spare day to day time, his responsibilities included managing the ambulance fleet, and ensuring the EMS department had all the supplies and equipment, from band aids to life saving medications, it needed to run smoothly. We wish Chief Fink a long and happy retirement with his wife, he will be missed! We are also wishing well to Paramedic Robert (Bob) Elling, who is retiring. Bob has been a paramedic since 1974, and shortly after began working with NYC EMS. In 1988, Bob was on the task force that was formed to create the system we now call Colonie EMS. He was a member of West Albany Ambulance and Colonie Village Ambulance before joining Colonie EMS in 1992. In 1993, Bob became a flight medic here in Colonie in conjunction with the NYSP. If you know any EMS providers locally, there is a good chance Bob taught them at HVCC or they used a book he wrote to study; Bob has written an incredible amount of EMS education books over the years, and continues to do so. 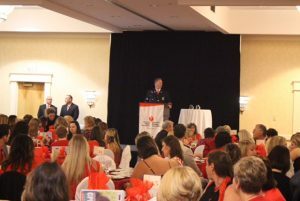 He is a proud and long time member of the American Heart Association serving on Regional, State and National faculty levels within the organization. It has been an honor to have Bob here for so many years, and he will be missed. We wish you and your family all the best! 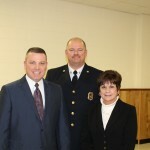 Congratulations to Captain Christopher Kostyun for his promotion to Assistant Chief! Chris joined CEMS in 1989, a year after he became a paramedic. He is a graduate of RPI with a degree in Computer Science. 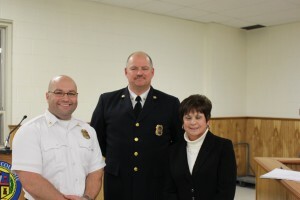 Chris also was a member of the West Albany Fire Department as well as Deputy Chief of Shaker Road Loudonville Fire Department from 2004-2005. Chris has been a Captain since 2003, and is looking forward to this new endeavor. 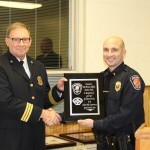 Congratulations to Paramedic Christopher Rench on his promotion to Captain! 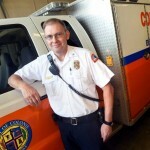 Chris began his career with CEMS as a volunteer EMT in 2004. He is a graduate of the HVCC Paramedic Program, Memorial Hospital School of Nursing, and became a fulltime paramedic in 2006. Since then, Chris has become a CPR and ACLS instructor for the department and has been a flight medic since 2011. 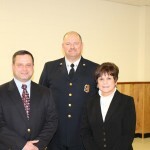 He also serves on the paramedic program faculty for SUNY Cobleskill. For several months, Chris had been temporarily filling in as a Captain, however he is now officially permanent. Congratulations to Paramedic Adam Patterson on being promoted from part time paramedic to full time paramedic! Adam graduated from the SUNY Cobleskill Paramedic Program in 2013, and has been working all over the Capital Region since then. He was hired with Colonie EMS in 2014 and we are happy to have him here full time now. 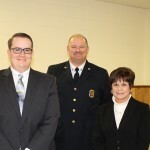 Adam also is a graduate from SCCC with an Associates Degree in Fire Protection. We are happy to welcome several new providers to the Colonie EMS family as well! Tim LeBlanc is joining us as a part time paramedic. Tim is a former CEMS explorer and has been a paramedic since 2009. Since then he has been working as a paramedic at Greenport Rescue and Air Methods. Welcome Tim! Robert Potter is joining us as a part time paramedic. 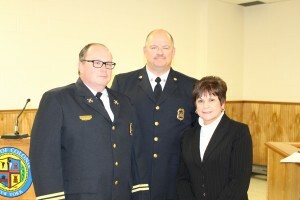 Robert has been involved in EMS and fire services for 28 years. He has been a paramedic since 2004 and is currently a firefighter in the City of Albany. Welcome Robert! Hayley Smith is joining us as a part time EMT. Hayley is a life long resident of Colonie and graduate of Siena College. She has been an EMT for 3 years and currently works at AMCH and Mohawk Ambulance. Welcome Hayley! Bryce Foggo is joining us as a part time EMT. Bryce also grew up in Colonie and is a graduate of Hobart College. He has been an EMT for 3 years and currently works at AMCH and Western Turnpike Rescue Squad. Welcome Bryce! Andrew Cohen is joining us as a part time EMT. Andrew is a life long resident of Colonie. 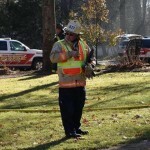 He is a graduate of Siena College, retired Menands police officer after 20 years and former Menands Fire Chief. He is currently a volunteer firefighter for Midway FD and is an EMT graduate from the most recent EMT class offered by CEMS. Welcome Andrew! 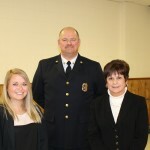 Samantha Sullivan is joining us as a volunteer EMT. Samantha grew up in Colonie and is a graduate of Maria College. She has been an EMT since 2015. Welcome Samantha! We look forward to continue to grow and evolve as an agency to better serve not only the community, but our members as well. As always, be well and be safe from our family to yours! 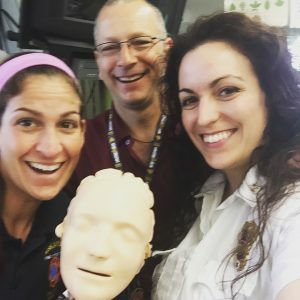 Good news, we are hosting a EMT course! If you are looking to become an EMT or know someone who does, this is a great opportunity. 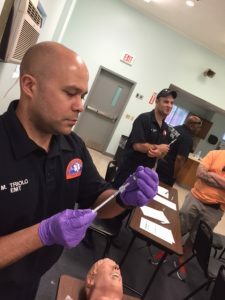 The course is open to all and will run from September 1 to the end of December, at which point students will have the opportunity to become NYS certified EMT basic providers. Instructors include Andrew Stern, Lois Deluca, and Erin Kelly. If you have any questions please reach out to the department. We look forward to seeing you! 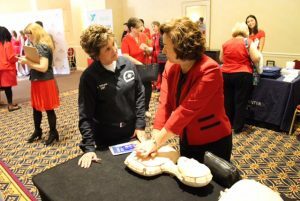 Schedule your community group for a Hands-Only CPR training, or get certified for work. Signup today for our email list and receive at least one email newsletter quarterly and other important updates.